David Ross of Afton, Tennessee, is the first recipient of a $2,500 scholarship awarded through his membership in the Sporty’s Flight Crew program. Dave plans to put this money toward an instrument rating. Bose practically invented Active Noise Reduction (ANR) headsets in the 1990s, and since then they have remained the top-selling ANR headset brand in aviation. What makes their headsets so popular? In a word, balance. We just finished about three months of flight testing with the latest version of the A20, and found a satisfying mix of quiet, comfort, clarity and features. Here's our pilot report. Stratus 3 is the latest generation of aviation's top weather receiver. It includes all the features that made previous models so popular, like subscription-free weather and traffic, plus new features and additional app support. Stratus 2S owners can receive a $200 rebate towards the purchase of a Stratus 3 with the Appareo Upgrade Program. Read on for details. We've got 3 locations this year! Sporty’s main tent is located in Outdoor Space #260, just outside of Exhibit Hangar B. The Stratus Booth is inside Hangar C, Booth #3147 located right across from ForeFlight. New for this year, Sporty's Wright Bros. Collection will be exhibiting inside Hangar B at booth #2159. As a Gold or Platinum member of Sporty's Flight Crew, you'll have access to over a dozen benefits for the active pilot. Enjoy free shipping, unlimited access to Sporty’s training courses, a pro subscription to Sporty's Takeoff app, exclusive savings, and much more. One additional benefit is access to $2,500 flight training scholarships. Here's how to apply. ProFlight is the first new headset from Bose since 2010, and it’s a completely new design that’s specifically made for professional pilots. In fact, it’s unlike any other aviation headset we’ve ever seen. 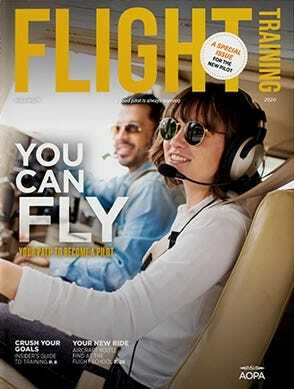 We spent a week flying with ProFlight in a variety of airplanes and overall we were impressed. Here’s our hands-on review. Fly Girl is an exciting new organization with a simple mission: encourage more girls and women to join the aviation community. We sat down with founder Natalie Kelley to learn about her journey as a pilot and the story behind the Fly Girl brand. Sporty’s has developed a fresh new option for flight instructors looking to renew their CFI certificate, using a modern online learning system to deliver innovative content. Sporty’s fully FAA-approved eFIRC will get you up to speed with the latest technology and new developments from the FAA, vastly improving your teaching skills. We even offer a paperless CFI renewal service (ACR processing). Let’s take a look at some of the unique features. Sporty's and AOPA have been partners for over 50 years, with a shared mission to make flying safer, easier and more fun. The latest addition to this long partnership is the AOPA World Mastercard. It's loaded with benefits for pilots, including 3% cash back1 on all purchases at Sporty's Pilot Shop3-5. Whether it's a Bose headset or a sectional chart, you can save every time you shop at Sporty's.